As far back as he can remember, Dr. Kai Kawasugi wanted to help people get better. At an early age he witnessed his uncle, who was a dentist, being thanked and embraced by a grateful patient for his transformative work on their smile. From that point forward, he was inspired to follow in his uncle’s footsteps and have an impact on those around him. He is also certified in braces through the American Orthodontic Society and was a Premier Invisalign® Provider. Dr. Kawasugi is particularly interested in how the alignment of a patient’s teeth and the structure of their mouth can affect their overall quality of life. Many times oral misalignment and crowding in both children and adults can cause behavioral issues, chewing problems, pain, poor sleep quality and breathing problems. He is certified in Healthy Start treatment for children and is trained in sleep apnea and snoring appliance therapy. Dr. Kawasugi also attended The Kois Center and has an extensive background in functional occlusion and TMJ therapy. 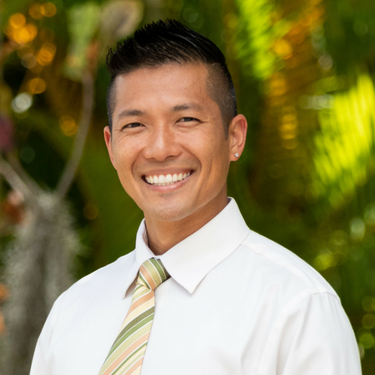 In order to provide his patients with the best possible care at Premier Dental Group HI, Dr. Kawasugi continues to take continuing education courses — most recently, courses have included sleep dentistry, Invisalign, and cosmetic procedures. As a dentist, Dr. Kawasugi believes that gratitude is the most rewarding part of his job. He loves helping others come to appreciate, take care of, and revel in their beautiful smiles. In addition, he has helped patients sleep better, eat more comfortably, reduce headaches or jaw pain and think more clearly—all by working on their oral health. When he isn’t crafting beautiful smiles in the practice, Dr. Kawasugi enjoys spending time with his wife and three children. Together, they enjoy the outdoors—especially snowboarding in Colorado and boogie boarding in Hawaii. Get to know more about Dr. Kai Kawasugi when you contact our practice to book your next appointment.